In the district of Maltepe in İstanbul, where the recounting of the votes cast for March 31 local elections was completed yesterday (April 16), the ruling Justice and Development Party (AKP) submitted a petition of extraordinary objection, requesting the cancellation of elections. 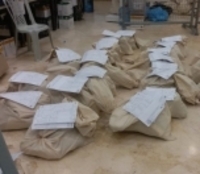 After the AKP objected to the unofficial local election results in Maltepe, the votes in 1,089 ballot boxes across the district were counted again and the recounting ended at midnight yesterday. 309 thousand votes were cast in total in the district and after these votes were counted again, the margin of votes between Ekrem İmamoğlu, the Metropolitan Mayor of İstanbul, and Binali Yıldırım, the candidate of the People's Alliance, fell by only 293 votes. İmamoğlu has won the elections in Maltepe by receiving 13 thousand 781 votes. Combined voting minutes started to be prepared in the district. After the recounting of votes ended last night, the Nationalist Movement Party (MHP) has also submitted a petition of extraordinary objection to the District Election Council, requesting that elections be cancelled in Maltepe.